In the aftermath of last week's market rout, it now appears that risk-parity is about to become a household word within financial circles, for obvious reasons discussed already on several prior occasions. Confirming this sentiment, is a note published late on Sunday London time (yes, there is a distinct urgency here) by Deutsche Bank's chief macro strategist, Alan Ruskin, focusing precisely on the threat of a sharp Risk Parity unwind, and what it means for FX. As Ruskin writes in "Risk Parity, FX & the end of financial repression" two or more consecutive weeks of higher US bond yields and lower equity prices, have become progressively less common since the 1980s/1990s, and especially since the 2008 financial crisis. 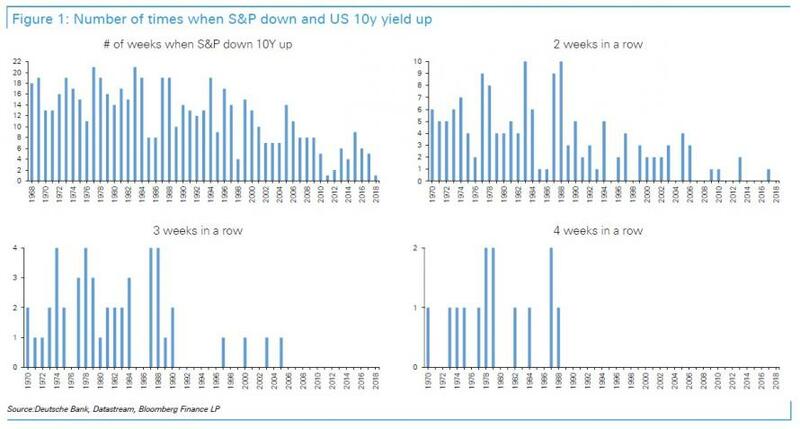 "Three weeks of equities down, 10y yields up, has not happened for more than a decade." This is shown in the charts below. Which brings us to what Ruskin calls "The bad news", namely that "the markets may be contending with a shift in two big macro factors that point to a change in the post-2008 world: i) reduced financial repression, and, ii) some inflation creep." Bond and equity prices falling sharply on the week may feel like an unusual environment, because in the last decade, it has become unusual. However, especially as we go back to the 1980s and 1990s it was a more frequent occurrence to see the following causal chain develop: Equities go up, supporting growth with a lag, pushing bond yields up, to the point where higher bond yields eventually pull equities down. In this way the equity - bond causality and correlation shifts, from a positive correlation where equities drive up yields, to a negative correlation as bond yields take the causal lead in pushing equities down. From a macro perspective what is intriguing about this dynamic is two old school factors could be back in play: i) At least in the US there is a confluence of inflationary factors - lagged demand, tight labor markets, the tax reforms impact on wages/bonuses and growth, higher oil prices, latent protectionism, and the weak USD. All these factors are apt to have a cumulative effect, chipping away at global disinflation and inflation inertia. ii) the Fed and other Central Bank's balance sheet adjustments, may signal the end of financial repression, and this repression likely helped risk parity trades. Risky assets are understandably worried because these are indeed important changes. How does risk-parity get involved? 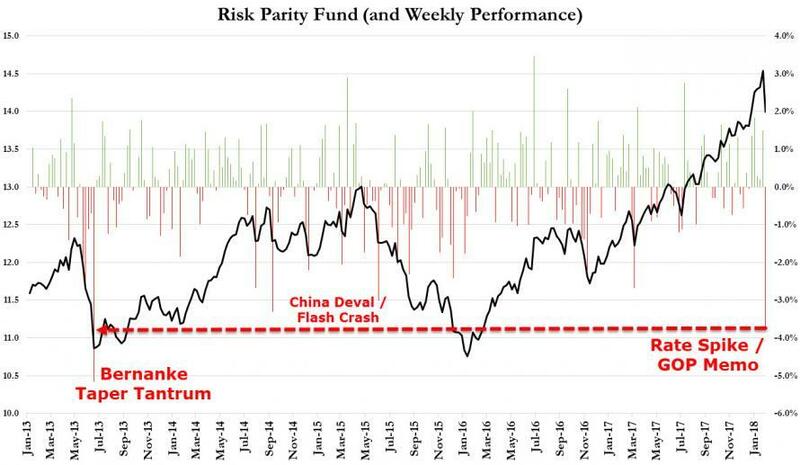 Well, as Ruskin noted, consecutive week after week of both bond and equity price declines is unusual, and very painful for risk-parity funds. This is likely to prove true in current circumstances, where the US bond market is such a stand-out relative to other G10 bond markets. Still, according to the DB strategist, risk parity - and the broader market will likely be spared a broader rout, as 10y TSY yields will likely not easily soar much above 3% without finding some real support, most obviously near the 3.03% January 2014 yield peak. Ruskin then makes a very good observation: "were bond yields to keep on going higher, it would do enough damage to stocks to start hurting growth expectations, in turn supporting bonds. Bond bears would in this way create the source of their own demise, which is not an unusual self correcting mechanism." In that sense we do not want to exaggerate the prospect of weeks like we have gone through that threaten risk parity trades consistently. At the same time, if inflation pressures and quantitative tightening are not about to change, then the weeks where both equities and bonds sell-off will become a good deal more frequent than we have seen since the Great Financial crisis. This, again, is a way of summarizing the "bad news." So what does this all mean for currencies, and how should one trade said bad news? 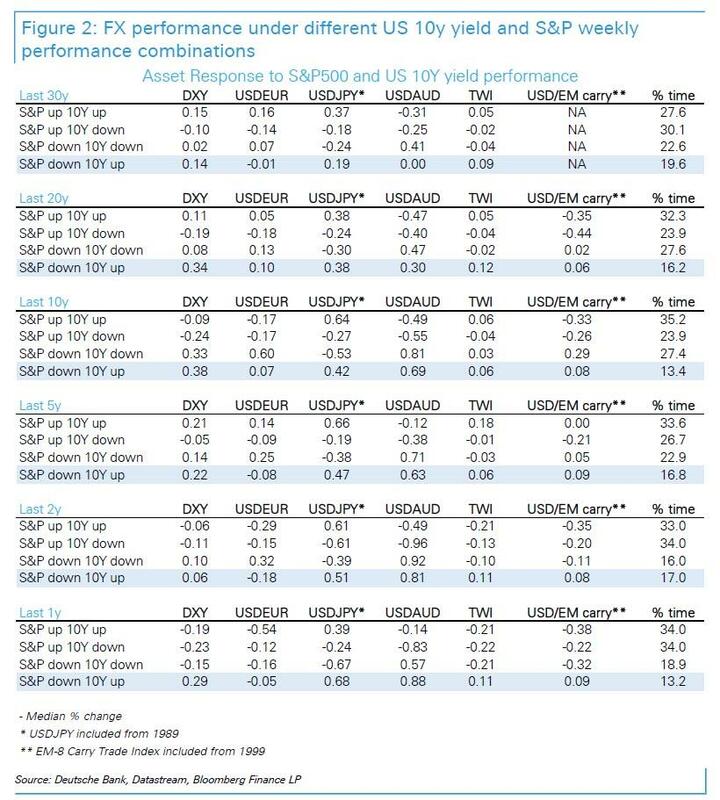 The table below shows how currencies have traded under different bond (10y yield) and equity (S&P) scenarios. Here Deutsche first demarcate each week as falling into one of 4 scenarios: S&P up, 10y yield up; S&P up 10y yield down; S&P down and 10y yield down, and S&P down, 10y yields down. We then looked at how currencies traded, taking medians and averages of the weekly performances for ach scenario. The percent of time when S&P is down and 10y yields are up is roughly 1 in 6 trading weeks, so not all that unusual, but certainly less common than the other scenarios. In the environment where 10y yields go up and equities go down, the USD tends to go up sharply versus the AUD at least in the past decade. The USD also goes up substantially versus the JPY. The USD is mixed to near flat versus the EUR (or before the EUR the DEM). This leaves the USD up moderately on a Trade weighted basis. Since 1999, the USD also appreciates (somewhat less than we might expect) versus EM carry - using the Bloomberg EM-8 carry index of cumulative total returns. The USD's positive response versus EM looks much more substantial when using average weekly gains as distinct from median weekly gains. This suggests that every now and then there are some very large negative EM moves, when US bond prices and stock prices go down, which is not a huge surprise. To summarize the "worst case" trade, one which sees stocks tumbling and yields continuing to surge, "history supports the thesis that when it feels like there is nowhere to hide between poor simultaneous trading conditions in the equity and fixed income markets, the USD and more recently the EUR have been the currencies to shelter in", Rusking concludes. .
"With bond and equity prices tumbling in the last week, the FX markets price action conformed remarkably closely to how the USD and other currencies have traded in tough risk parity environments of the past 30 years." Of course, with a gigantic $10 trillion global synthetic dollar short - according to the BIS - one which has so far avoided a squeeze thanks to the record surge in risk assets, it is hardly rocket surgery then if the carpet is pulled from under the market, it is the US Dollar that will surge; after all that is precisely what has happened during every previous crisis. The real question is what happens if stocks and bond tumble, and the dollar does not go up. That would be the real crisis, and one which would explain not only the record recent cryptocurrency bid, but also confirm the fact that the dollar's day as the world's primary reserve are numbered.